The town of Borjomi is a resort in south-central Georgia located roughly two and a half hours by road from Tbilisi. 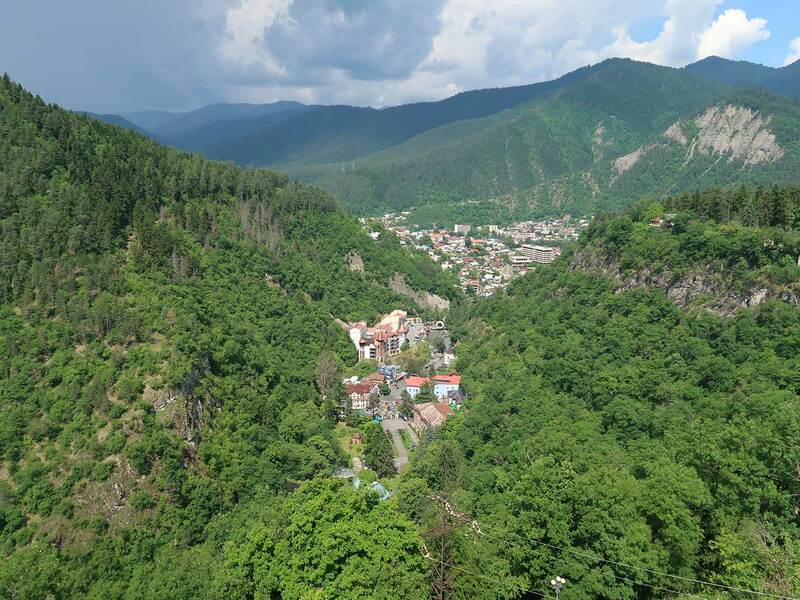 It stands on the edge of the enormous Borjomi-Kharagauli National Park, a forested reserve of almost nine hundred square kilometres with a wide variety of walking trails and tourist attractions. 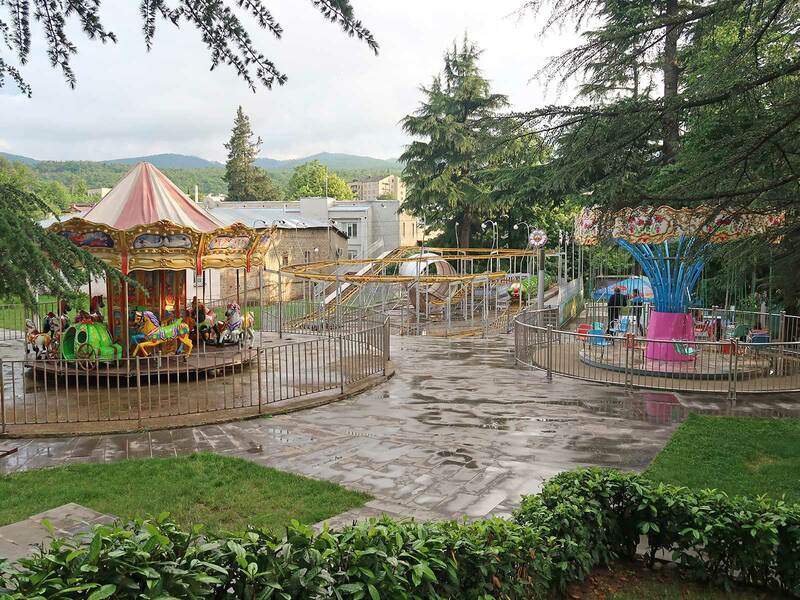 As of this writing the reserve has no amusement rides, but those after such things are catered for by Borjomi Central Park, a comparatively modest facility in the center of the town with a variety of attractions set within a landscaped garden. Readers should be aware that the only parking in the immediate vicinity is reserved for guests of the Crowne Plaza Hotel located next to the main gate; we ended up in a spot almost a kilometre away. On arrival in the area our eyes were immediately drawn to a Giant Wheel at the top of a mountain standing proudly amidst a sea of tall trees. The sight reminded me very much of parks in Japan, where even the smallest amusement parks tend to be anchored by an oversized BFOFW. We decided not to hike to the top, but instead took a cable car that cost just five lari (~€1.75) for a one way ticket. We were about half way up before we realised our mistake; the coaster and other rides were clearly visible in the valley some five hundred metres below. We briefly considered a direct return to ground level, but decided it was worth investing a further two lari (~€0.70) on the wheel for the spectacular view, pictured above. It was almost an hour later when we finally made our way into the park. There was a colourful photo opportunity with about a hundred toy Disney characters located just inside the entrance, but a sign indicated that there was a one lari charge per shot which we deemed excessive. Instead we walked the considerable distance back to Typhoon (#2437), a twelve year old Interpark Cyclon that is (as of this writing) the oldest known roller coaster in Georgia. It was interesting to see the hardware painted so as to blend almost completely into the surrounding environs, giving it a very different appearance to most coasters where garish (or at least dramatic) colours are the norm. We had expected a run-of-the-mill carnival ride, and most of the ride was just that, delivering a decent but not particularly memorable experience that would have been quickly forgotten. There was a surprise towards the end, however; a brake segment prior to the final drop was out of action, resulting in an incredibly powerful airtime moment coupled with a powerful aftershock at the apex of the following climb. This was as thrilling as it was unexpected, making the ride far and away the most exciting of its type that I've experienced in my travels. We ended up doing four laps, one in each seat, and we'd have gone back for even more had we not other locations to investigate. Our second stop for the day was supposed to be at Tatrabob, an Alpine Coaster from French manufacturer Techfun that the Georgian Prime Minister described as "so cool" in 2016. Unfortunately the ride was out of service today; a member of staff at the Bakuriani Resort told us that it would reopen on June 23rd. We had no choice but to proceed to our next destination. We were about half way to Rustavi Youth Park when the weather closed in in spectacular fashion. Torrential rain reduced visibility to no more than twenty metres, causing many drivers to stop and wait for an improvement. I decided to keep going at around one third of the posted limit, and felt positively virtuous as I was overtaken every few minutes by articulated trucks. The sky had cleared by the time we arrived in the Rustavi area, but there was a lot of standing water around, and given that we didn't have a lot of hope for our credit. The park gate was ajar however, and we could hear low volume music playing. Moments later we had confirmed that the rides were open. The friendly if slightly bewildered staff dried off our seats on the Dragon Coaster (#2438) before sending us for three enjoyable laps. The only potential hazard was a tree standing next to the main drop with foliage at head height, but that was easily avoided. All of us were quite tired at this stage, and a stupidly early flight the next morning made the idea of getting back to the hotel before nightfall quite appealing. 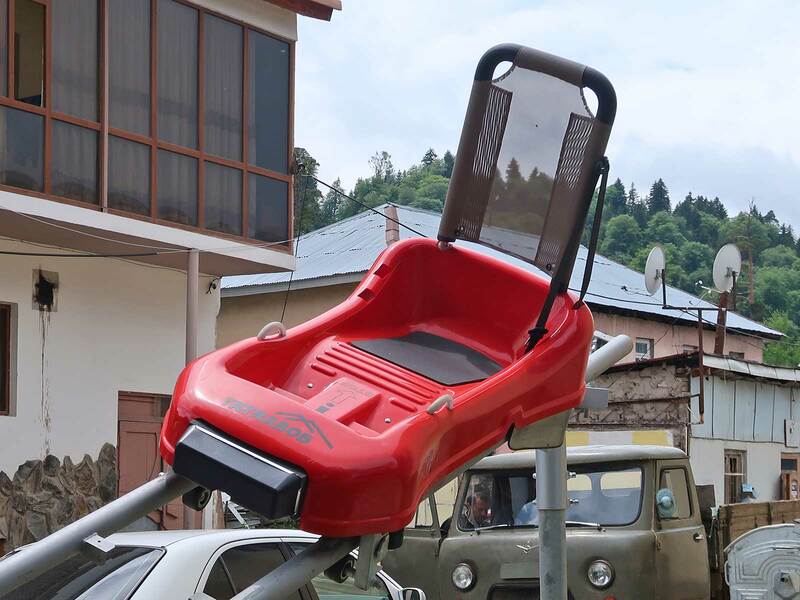 However, we knew of one last Georgian roller coaster in the town of Telavi which we could get to at the cost of around three hours of downtime. We had no information about our target at all beyond its location, and the unsettled weather earlier in the day made going there a serious long shot, but after a quick vote three out of four of us decided that it was worth sacrificing some rest in order to investigate in person. The park is a public garden with a performance stage, a street market, and five rides: bumper cars, a carousel, swings, a double inverter ship, and a family coaster. Several of the attractions are painted with the name Kakheti, implying that they might have been travelled at one stage in their lives. That said, satellite imagery indicates that all have been in their present location since 2014 if not before, and up close it is very obvious that the installations are intended to be permanent. Brucomela (#2439) is a standard layout ride that eschews the typical apple in favour of a barrel-shaped tunnel above the drop. The operator had a lot of trouble getting the train to leave the station tonight, but eventually managed it by rocking one of the cars from side to side. The ride itself was grossly ordinary, but that didn't diminish our enjoyment in the slightest; we were nothing short of thrilled to have ticked off yet another obscure Wacky Worm.